A comprehensive history of the early history of Latvian sound recordings has been released. Entitled Latviešu skaņuplašu vēsture (ISBN 978-9934-511-19-6, SIA Vesta-LK, 367 pages), the book was written by historian and collector Atis Gunivaldis Bērtiņš, and presents a thorough and detailed review of Latvian recordings in the pre-World War II era. Besides providing a near complete discography of all recordings with Latvian artists (including records produced both in Latvian and internationally), the book also provides biographical notes on many of the artists that appear on these records, such as the ‘Latgalian Nightingale’ Helēna Ersa-Kozlovska , humorist Jānis Āre, and the conductor of the Bellacord Electro orchestra Teodors Vējš, among many others. 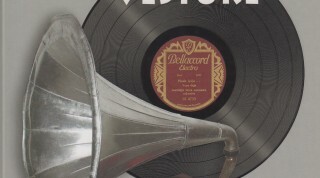 Besides Bellacord Electro (the major Latvian record label prior to World War II and producer of thousands of records from their factory in Riga), the book mentions many less well known labels such as Lyracord, Zonophone, and Tri-Ergon. The book provides many historical anecdotes about the artists – for example, how in 1940, 11 of the records by the vocal comedic duo Brāļi Laivinieki were deemed ‘vulgar and of little artistic value’ by the Press division of the Latvian Social Ministry, and were to be taken out of circulation. However, the announcement had little effect, as these offending records were nowhere to be found. The book is meant as the first volume in a multi-volume series, with the next volume to be about Latvian recordings after World War II. This message is for Egils Kaljo. I am a Real Estate Broker in Toronto, Canada an I am involved in liquidating an estate here in Canada. There is a collection of about 330 different Latvian LP’s(recorded in Latvia and Abroad), all catalogued as to Title and Artist. All are in excellent condition. There are also about 80 Latvian vinyl 45′( not to mention duplicates of about 100 albums). If you are interested, get in touch with me at jkorbs@sympatico.ca and I will forward you the list. The only cost would be shipping.